Microscale stocks 100's of Road names. 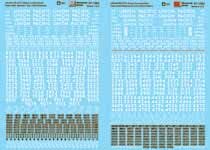 We stock over 4,000 different Decal Sets and trying to find them is easy, here is how you do it. You can use the Quick Links Drop-Down box above and choose your road name, or use one of our direct Road name links below or use our search tool for a more broad search. HO Scale - UP "Spirit of the Union Pacific"
N Scale - UP "Spirit of the Union Pacific"